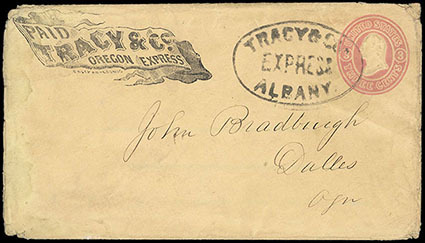 Tracy & Co. Express, Albany, oval handstamp on 3¢ pink entire with black company ribbon frank to Dalles, Ogn., some edge wear, F.-V.F. Tracy & Co., Oregon Express "Boise Express. Paid 50 Cts. 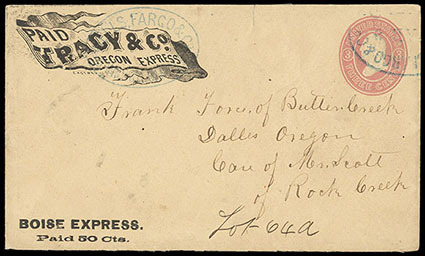 ", ribbon frank with printed two-line Boise Express at bottom left, on 3¢ pink (U35) buff entire cancelled by blue "Wells Fargo & Co., Bannock City I.T., May 5" oval and additional strike over Tracy & Co. frank; addressed to "Frank Force of Butler Creek, Dalles, Oregon, Care of Mr. Scott of Rock Creek", trivial cover tear at top, Very Fine and choice, a very scarce usage of the Tracy & Co. Boise Express frank., Thomas No. TRA-007, TRA-600. On November 16, 1863, The Oregonian reported: "Tracy & Co. have disposed of their express business between Portland and the Idaho mines to Wells Fargo & Co. for the sum of $3,000, conditioned that T & Co. not establish another line for six months…" The Bannock City oval handstamp on both the frank and the entire confirm that Wells Fargo was in total possession of this former Tracy line. 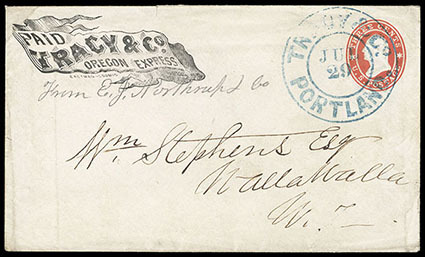 Tracy & Co. Express, Portland, bold blue oval handstamp on 1853-55 3¢ Nesbitt entire originating from Weaverville, Cal. 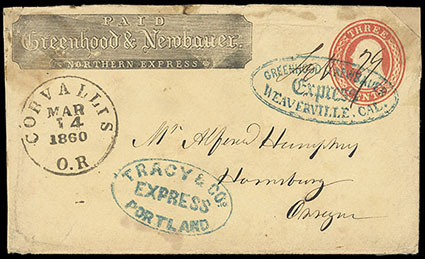 with blue oval "Greenhood & Newbauer" company handstamp with manuscript "Feb. 29" date and black company frank, addressed to Harrisburg, Ore., cover transferred to Wells, Fargo & Co. and carried to Portland and transferred the cover to Tracy & Co. who carried it to Corvallis, where it was placed in the Post Office with Corvallis, Ore., Mar. 14, 1860 cds for transmission to Harrisburg, some light edge wear & top right corner replaced, F.-V.F., a very rare triple express usage. 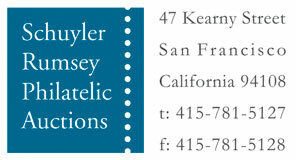 Tracy & Co., Jul. 29, Portland, blue balloon type double circle handstamp on 3¢ Star Die entire with ribbon company frank and addressed to Walla Walla, bit of flap torn off, Very Fine and attractive. 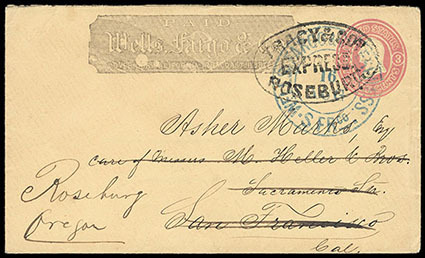 Tracy & Co. Express, Roseburg, bold oval handstamp on 3¢ pink entire to San Francisco and forwarded to back to Roseburg, Ore. with large blue Wells, Fargo & Co. San Francisco double circle handstamp, Extremely Fine and choice, a stunning cover in near perfect condition. Edward W. Tracy arrived in Portland Ore. on July 8, 1859 as Wells Fargo's General Agent for the Washington and Oregon Territories. He established the Wells Fargo office and as early as July 22nd formed a partnership with E. Norton Jr. and E.L. James to operate his own express service throughout the interior of Oregon. At first this service ran tri-weekly from Portland through the Willamette Valley to Eugene City Ore. It extended overland from this point to Roseburg, Winchester and Oakland Ore. This southern route would eventually connect with Beckman's Express at Jacksonville and Wells Fargo at Portland. A second route would soon follow based out of Portland following the Columbia River to The Dalles, then up river to Walla Walla Wash. From Walla Walla it ran overland to service the mines in the eastern Washington area. When gold was discovered in Idaho Terr., a route from Walla Walla was pushed into Lewiston where the mining activity along the Clearwater and Salmon Rivers were supported. In March 1862, the partial with Norton and James dissolved, and Tracy sold his Portland to Idaho express service to Wells Fargo. 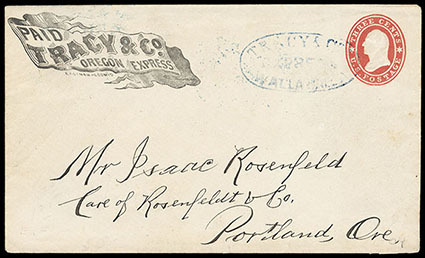 Tracy & Co. Express, Walla Walla, blue oval handstamp on 3¢ Star Die entire ribbon company frank, used as part of a paste-up with address to Portland, which may not be original, some defects on reverse due to paste-up, , F.-V.F.